If you own social media accounts and have checked your timeline recently, you might have seen the buzz about “Kony 2012” and if you’re wondering what is that? The name Jason Russel has your answer. Last night the “Kony 2012” produced by Invisible Children went viral and I watched as the power of social media unfolded about an idea. Filmmaker Jason Russel has been has been working for serveral years in central Africa to stop the rebel army and their leader Joseph Kony. In this 27 minute video he explains more in-depth his misson; speaking to lawmakers, congress, community members, and people like yourself all over the world. Russel’s new idea to stop Kony and give these innocent children their freedom was to take to SOCIAL MEDIA. In my opinion, this media tool is the most powerful form to bring an idea together and make people aware. Immediately after watching the video I was inspired to help out in any way that I can. 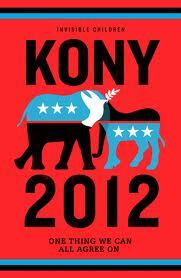 Just by tweeting #StopKony and #MakeKonyFamous we are showing awareness of this issue. I’ll be honest to say I never heard of Joseph Kony, however I am very familiar and saddened by the rebel army and war that uses innocent children to kill and fight in Africa. So whether you have no idea what’s going on in Africa or can’t figure out a way to take action, Jason Russel has made that possible for you.